In this lovely photograph taken 1850 at Norval Studio at N. Station Road which was just outside Dunfermline in Scotland. They are the McDonnell sisters, on the right seated is the eldest Helen, then standing we have Bridget and finally the youngest Rose. Now their parents were James McDonnell who had been born in the townland of Waterford near Cushendall and his wife Mary Murray possibly from the Red Bay caves in which was a blacksmith, a school and a town house, which were all made from stone blocks, there in Waterford they raised the 3 girls and two boys John and Alexander, they then all emigrated to Kelso, Scotland in 1840 where there was a thriving Linen industry. 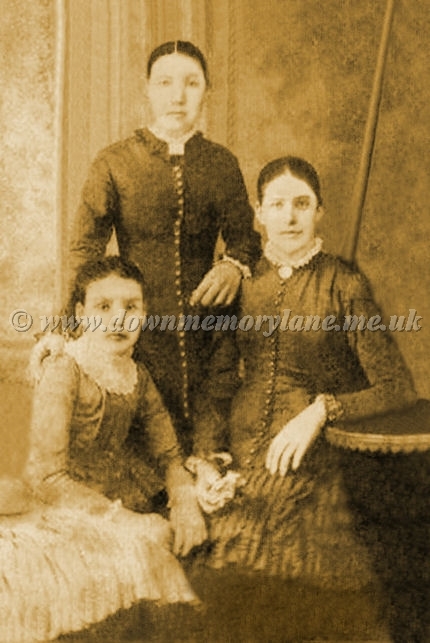 The three sisters eventually went to live 70 miles away,( quite a distance in those days ) in Lochgelly which was 9.5 miles from Dunfermline where they went to work in one of the Lace factories as weavers on the looms.